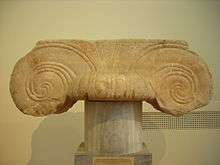 Aeolic column with half-capital, Bardo National Museum, Tunis. The Aeolic order or Aeolian order was an early order of Classical architecture. It has a strong similarity to the better known Ionic order, but differs in the capital, where a palmette rises between the two outer volutes, rather than them being linked horizontally by a form at the top of the capital. Many examples also show simplified details compared to the Ionic. The form developed in northwestern Asia Minor, and developed out of Syrian and Phoenician capitals. It is also seen in some temples in Sicily and ancient Palestine, and is named for the Aeolian Islands. The earliest surviving examples of the Aeolic order are contemporary with the emergence of the Ionic and Doric orders in the 6th century BC. Some authorities have suggested that the Ionic style represents a development of the Aeolic, but others disagree. Some Etruscan tombs show a similar capital, with two large volutes that do not lie flat, but no palmette in the centre. The Aeolic order fell out of use at the end of the Archaic Period. ↑ Yigal Shiloh (1979). The Proto-Aeolic capital and Israelite ashlar masonry. Institute of Archaeology, Hebrew University of Jerusalem. ↑ Philip P. Betancourt. The Aeolic Style in Architecture: A Survey of its Development in Palestine, the Halikarnassos Peninsula, and Greece, 1000-500 B.C (Princeton University Press) 1977.